It is that we all are pretty much aware of how WordPress online ordering has made an enormous impact on our lives. It has made everything very easy for us to get things in our doorsteps within fewer times. Getting a WordPress restaurant ordering has also made a significant impact on all individual who has a hectic life with a daily work schedule. Reason being for that, they don’t get enough time to have something to eat or to have other things for their living in this busy life. But the introduction of WordPress online food ordering system plugin to place an online order, anytime and from anywhere, has made things better now, and it seems to be very easy for all of us to get easy access of almost everything within our hands at a minimal time. But its time now to make more advancements in this area, to gear up this online ordering process very few companies in today market has introduced WordPress restaurant ordering plugin, to help any individuals to order from any website they are browsing without entering into the restaurant website or any other business types. i.e., Any individual or any customer doesn’t have to go to any respective company website to order food or clothing. Instead, they can order it from a widget or WordPress online food ordering system plugin of that company. It’s so easy and flexible to be used. Also, with your Ordering Widget, you won’t lose any customers & can show your store on any websites you want. Likewise, for any WordPress online ordering websites, any individual can get the help of a widget to make their customer place an order easily for their needs within the widget. Let me explain how. Suppose if you have a website in WordPress for other stuff apart from anything that is not related to ordering something online, also you have a separate business website, say for only order online for food, but you need to publish your food ordering business website among customers and need to raise your sales, in that case, you can use the ordering widget by integrating it into your WordPress website, to make your customers not only to browse about other business that is in WordPress but also to order from your food ordering business website. Hence by this, you will get massive traffic for both of your business as well as can make huge sales online. Integrate WordPress food ordering widget as many times as you need, With your Ordering Widget, you can also embed your multi-store or single-stores on any website, it will fit perfectly, friendly as always & with any template you want. Are you ready to get your Ordering Website/ WordPress online food ordering system plugin anywhere? Ready to make more sales and profit? 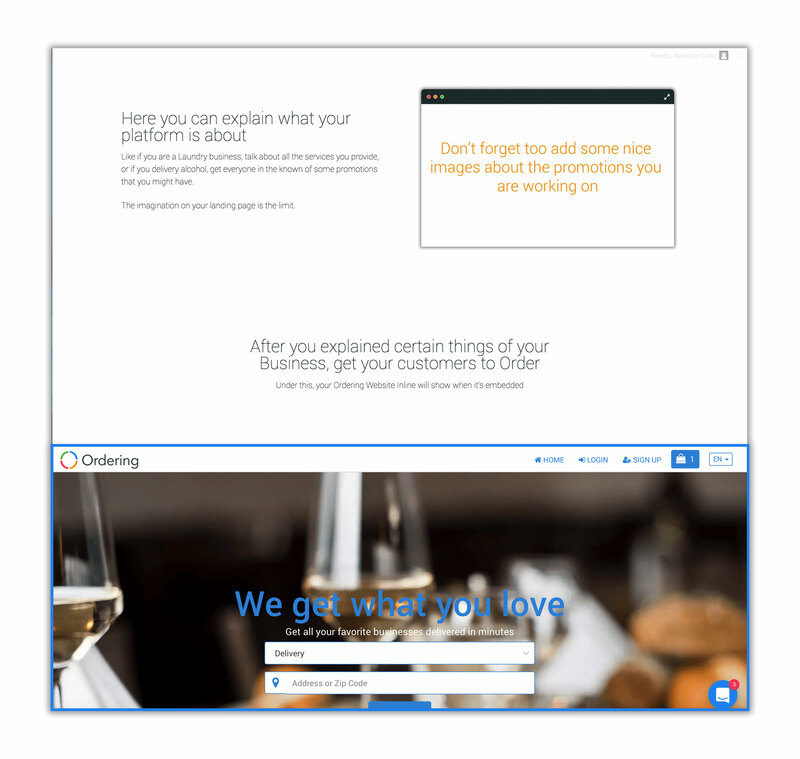 let me show you how to integrate your Website anywhere, I am sure it’ll help you to get more sales and some marketing strategies. Also, sites like, Facebook or maybe a landing page on WordPress that you have, your imagination is the limit. First, you have to get in your Ordering Editor (To get the editor, you have to signup with ordering) & Log in as Superadmin to get access to Ordering Channels. After you get in this part of the Ordering Editor, you have to grab the Code that is in “Integration on your website (inline)” in the #2 option, after you get it you can embed that code anywhere, just be sure where you are putting it is JS supportable. For example, in WordPress, there is an option called “RAW JS” where you just put the code and it’ll automatically show it on the front end. Increase your restaurants and stores sales, integrate WordPress online ordering on their websites to help their customers save time and order faster. All you need to do is copy the <code> that your Ordering Builder will provide you, and paste it on the WordPress food ordering website you want. That’s it, start selling! You can choose your wordpress restaurant ordering widget size easily. Show your widget according to your needs, full page for easier ordering or chat like style to be discrete at the bottom right of your site, it’s your call. Using a wordpress restaurant ordering plugin widget is like a kids play, i.e., the steps to place an order form the widget is very straightforward and comfortable, it will make any user to place an order from a widget, not more than a minute. One who has used the widget will love to order again and again from there, instead of ordering anything from the app or the wordpress restaurant ordering website, as it reduces the customer time in going through with the steps that one have to follow while placing an order form the site or from the app. Widget helps to minimize those steps and make the customer place the order in no time. That way one individual who is in a rush, can make the deal to order anything online within no time. Integrating your WordPress food ordering widget is that easy and flexible within your ordering website or to any other pages or in WordPress website, all that you have to do is that to copy the codes and paste it to the end of the <body> or <head> tag on the page you need to show & all of that can be quickly done from our ordering builder. Doing the same, it is not essential that you should be an IT expert or a developer, any individual with just necessary skills of understanding things can do that as like an experts do. 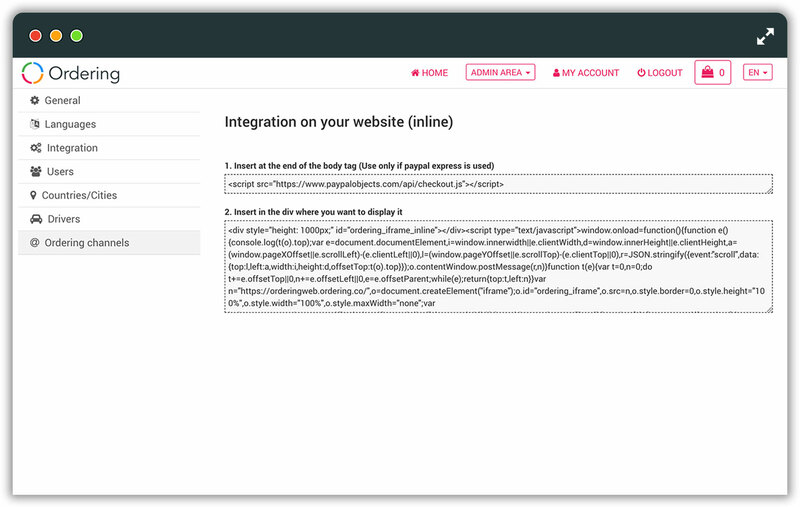 Moreover, using our ordering builder you don’t have to touch the codes, i.e., you can make the integrations easily by some natural settings steps. Facing any problems to understand our Widget or having problems to under our system? Feel free to reach us anytime, we are online!